The Whiskey Sour, as indicated by its name, falls squarely in the "sour" family of cocktails. The building blocks of a sour are familiar if you've explored our recipes for The Gimlet and The Classic Daiquiri: spirit + sugar + citrus. In a Whiskey Sour, fresh lemon juice meets whiskey, with added support from a rich simple syrup and an egg white. That's right, an egg white right in the mix. Pastry chefs in the 1600s started experimenting with egg whites and discovered that by whipping them with sugar, they could create a light and fluffy meringue that added a decadent texture to cakes and pastries. By whipping egg whites, you start to break down their tight protein structure while incorporating air. Added to a cocktail, egg whites create an airy foam that helps elevate the texture and highlights the individual ingredients of the drink. 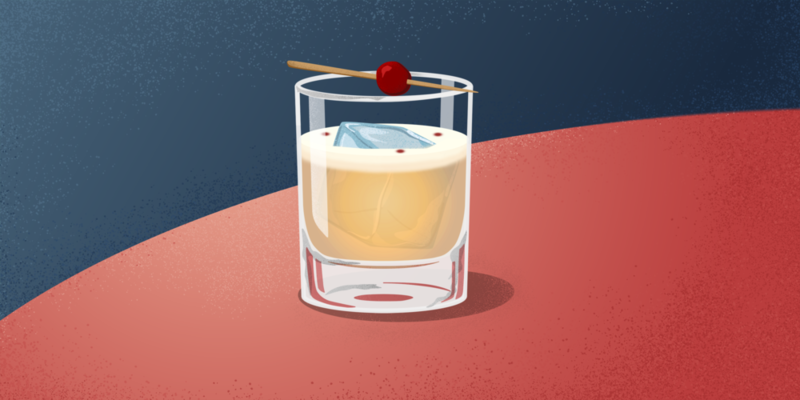 Unfortunately, the history of the Whiskey Sour is fraught with tragic tasting sour mixes, unskilled bartenders, and growing fears about consuming raw egg whites–all of which resulted in decades of terrible drinks. But don't let this dissuade you–creating a perfect whiskey sour at home is easy and safe if you just pay attention to a few key steps. The biggest factor to consider is freshness. Fresh ingredients taste better, and in the case of eggs, safeguards you from foodborne illnesses. Luckily, there's a fool-proof way to test if your eggs are fresh! Here in Portland, where there's a farmers market every day of the week, it's easy to get your hands on incredibly fresh eggs. But if you're looking for a way to test your store bought eggs, just place a whole uncracked egg into a glass of water. If it floats, the egg is too old. If it sinks to the bottom of the glass, you're good to go. To make this drink, start by adding your separated egg white to a clean cocktail shaker. You'll then want to dry shake the egg white (shaking without ice) for about 30 seconds to start breaking down the proteins. Once the egg white starts to froth up, add your whiskey, fresh lemon juice, simple syrup and a scoop of ice, and shake again for 15-20 seconds until the shaker is cold. Strain the mix into a cocktail glass or a rocks glass with a large cube. You should see a nice thick layer of foam form at the top of the glass. Next, add a couple dashes of Angostura bitters on top and garnish with a brandied cherry . A whiskey sour can be made with any whiskey, but we particularly love ours with Burnside West End Blend. This blended American Whiskey has sweet corn and peach skin notes with a light finish that works really well without being overpowering. For a slightly more complex taste, opt for a straight bourbon like our Burnside Goose Hollow RSV.